If you ask Lance Werner, executive director of the Kent District Library (KDL), MI, what makes him a strong leader, an effective legislative advocate, and a champion of access for his patrons, his answer is simple: it’s all about forming relationships—with his staff, legislators, local business owners and CEOs, county commissioners, Michigan Library Association (MLA) administrators, LIS educators, patrons, and anyone else in a 100-mile radius. Ask him again, and he’ll bring up words such as kindness and empathy and that he loves his job. Underneath those soft skills lie persistence and passion. Werner gets the job done, whether that involves convincing KDL trustees to invest $400,000 in ebooks, testifying before the Michigan Senate and House committees to win tax capture amnesty for libraries, securing health care for part-time KDL employees, spearheading a countywide literacy initiative, or securing grant money to bring back the library’s bookmobile after a 30-year hiatus. It’s no surprise that he was named a 2016 LJ Mover & Shaker and the 2017 MLA Librarian of the Year. 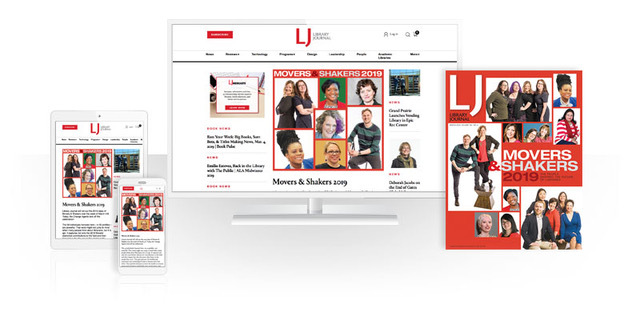 Add to those accolades the 2018 ­Library Journal Librarian of the Year, sponsored by Baker & Taylor. Ask Werner why, and he’ll tell you it’s just a matter of being a regular guy who cares about his constituents. Ask his constituents, and they’ll tell you there’s more to the story. Werner’s path to KDL was, as he puts it, “meandering.” He initially wanted to become an FBI agent and enrolled in the Michigan State University College of Law in East Lansing. Halfway through law school, Werner met his wife, who had a young daughter, and “I decided maybe working for the FBI wasn’t such a great job for a new family man,” he recalls. 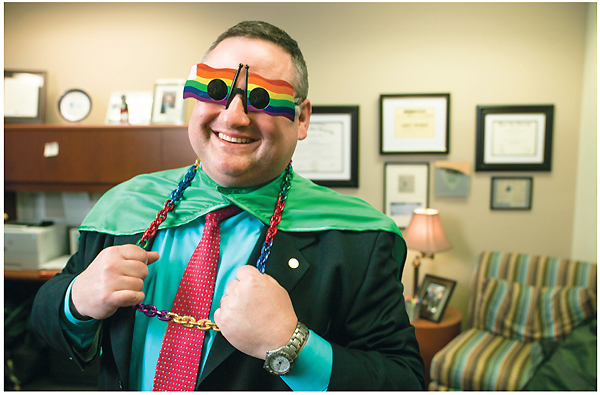 He loved his part-time library job (following in the footsteps of his mother, a librarian), so he decided to pursue a master’s degree in library and information science—not instead of the law degree but in addition to it. He took a job at the Library of Michigan, in Lansing, as a library law specialist. In the process, “I developed this profound respect and a greater understanding of the invaluable work that public libraries do,” says Werner. In 2009, he made the move to the Capital Area District Library, also in Lansing, where he served as director for two years. Yet Werner had his sights set on the 18-branch KDL, which had a reputation for out-of-the-box thinking that appealed to him. 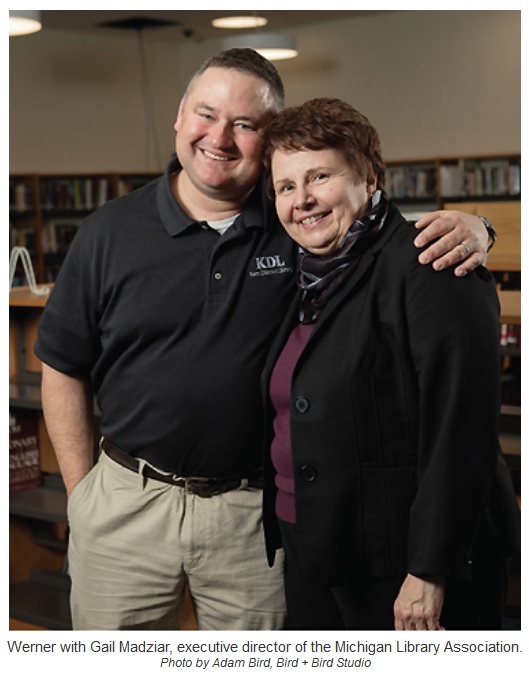 When the director’s position opened up at KDL, longtime board member Shirley Bruursema encouraged Werner to apply; he stepped into the role in 2011. Still, content is only useful if it can be accessed. Much of Kent County’s 734 square miles are rural, and with the state’s savage winters, transportation is a major issue. Werner recognized the county’s access limitations as a digital divide issue and began circulating iPads and Wi-Fi hot spots. “It’s another philosophy of ours that we want to be wherever people are—we want to meet them on their own terms,” Werner explains. In addition to ensuring that the library’s now-robust electronic collection could reach all customers, Werner had a series of Little Free Libraries installed around the county. There are currently 14, housed in community centers, senior centers, parks, and the local airport. And thanks to a recent $208,000 grant from the Steelcase Foundation, KDL’s new bookmobile will be hitting the streets in 2018. Campos, who is fluent in Spanish; 6.55 percent of Kent County’s population is made up of native Spanish speakers. 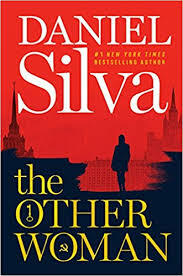 The library has since seen increased interest in Spanish materials and more Spanish entries in the Write Michigan writing contest it cosponsors. Werner has also stepped up KDL’s literacy initiatives. Approximately one-third of Kent County’s third graders read below grade level, and the low literacy rate among adults hovers at about 14 percent. Under his watch, KDL instituted a multipronged early literacy resource, Play Grow Read, that provides information for parents and caregivers and features crafts, recipes, and other activities linked to reading. Local organizations, including the Literacy Center of West Michigan (LCWM), the Kent Intermediate School District, and Steelcase Corporation, have actively partnered with the library to help implement the program, as well as a collaboration between Grand Rapids Community College and KDL to provide all-ages STEAM (science, technology, engineering, the arts, and mathematics) programming. 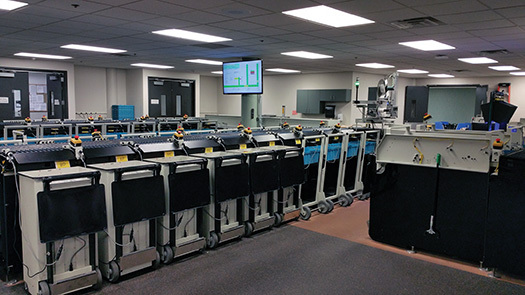 The Kelloggsville school district opened a new high school in October 2017, with a multilevel media center staffed by KDL librarians and stocked with materials from the library’s collection that will feature a rotation of KDL programs. Not only will the media center serve Kelloggsville High School students—71 percent of whom come from low-income families—but it will be open to the general public outside of school hours. While shifting the culture both in and outside of his library, Werner has also been effecting top-down changes for libraries across the state. Since joining the MLA in 2009, Werner has been the organization’s president and chair of the legislative committee and an active advocate on its behalf. In late 2015, the state was faced with an amended finance reform measure, SB 571, containing language that would have prevented libraries from communicating “by means of radio, television, mass mailing, or prerecorded telephone message if that communication references a local ballot question” for 60 days prior to an election. This would have effectively placed a gag order on libraries when they most needed to get the word out. 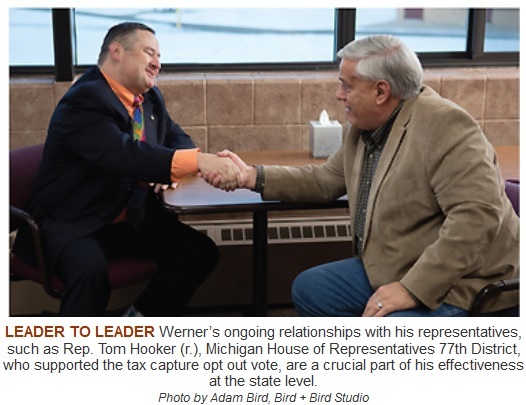 Werner met with Lisa Posthumus Lyons, then a Republican member of the Michigan House of Representatives from Kent County’s district, to suggest alternate language for the bill. “I understand you’re worried about this whole concept of electioneering, using public moneys to [advocate] for the yes vote, which is illegal,” he recalled telling Lyons. “But this legislation is going to hurt us.” Lyons agreed and adopted some of the wording Werner suggested. The bill eventually passed despite their efforts, although Gov. Rick Snyder provided clarifying language that worked in libraries’ favor. Werner’s efforts on tax capture relief, however, were an unqualified win. 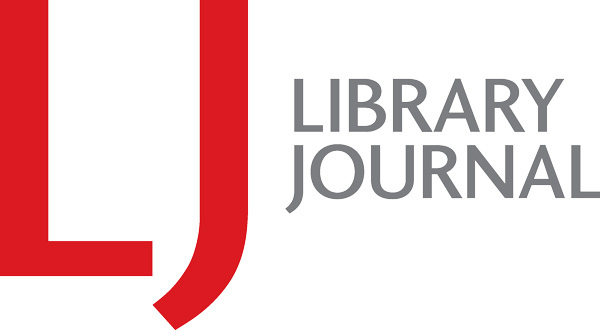 For more than 20 years, the MLA and the library community had been fighting the use of a percentage of library millages to benefit various Michigan development organizations, often against the libraries’ wishes and without taxpayer approval, that took more than $10 million from library coffers annually. Werner testified before the state House and Senate for a bill exempting libraries from the allocation as part of an extensive library-driven advocacy effort. In early 2017, SB 619-624, legislation redressing that appropriation, passed both chambers. “This is what I said to the legislators,” Werner told LJ. “This is important to us because transparency’s important. When people come to me and [ask], ‘What’s my money being used for?’ I can’t tell them.... And that’s a crime.” Governor Snyder signed the bill into law on January 10, and Michigan libraries are now entitled to opt out of all new tax capture. Recently, Werner and the KDL human resources (HR) department unveiled a series of benefit programs for part-time staff members, including one that will provide primary health care at no cost to the employee. The service covers doctors’ visits and prescriptions in full. 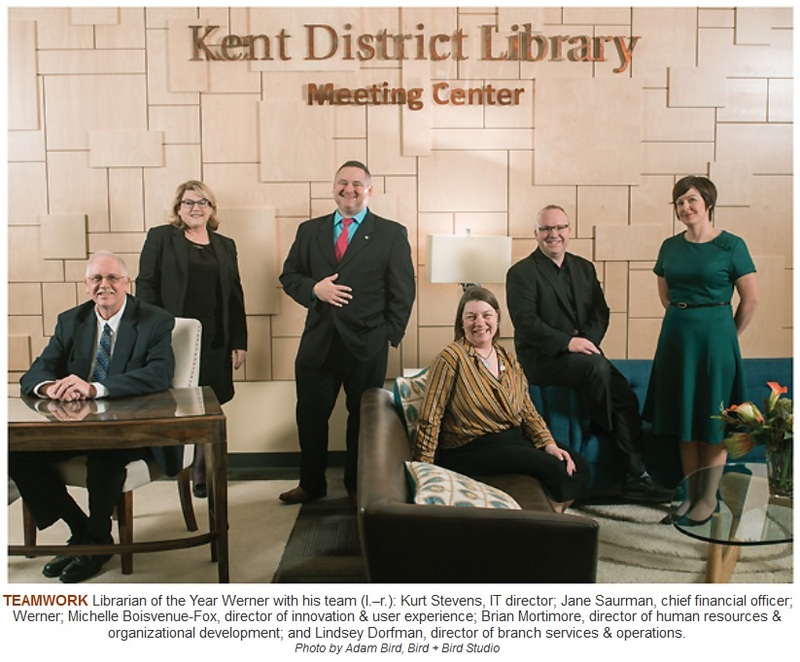 KDL has also instituted a four-year student loan assistance program for employees and in 2017 arranged a disability audit for the branches, conducted by Disability Advocates of Kent County (DAKC). As a result, the library became the first recipient of DAKC’s Community Champion Award. Werner’s care extends far beyond the library walls. In October 2017, he helped organize a KDL fundraiser and book drive to help the Port Arthur Public Library, TX, reopen its doors after losing all its children’s materials, DVDs, and audiobooks to damage from Hurricane Harvey. The goal is to get the Texas library up and running again by March, but along the way KDL hopes to inspire other libraries to support one another. So privileged and proud to say I knew you when. You're the best kind of librarian and I'm pleased to see this national recognition of your dedication and passion for libraries and your community. How wonderful for you!! Congratulations Lance! Looking forward to staying in communication with you. Congratulations, Lance! Wonderful news, but no surprise. 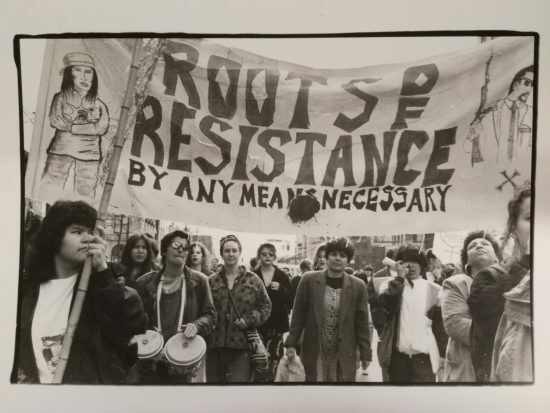 When the Canadian PLLeaders Program met with you in June in Chicago, we were all in deep admiration of your leadership approach and we loved your stories of advocacy in action. Thank you for all you shared with us. We are proud to know you! 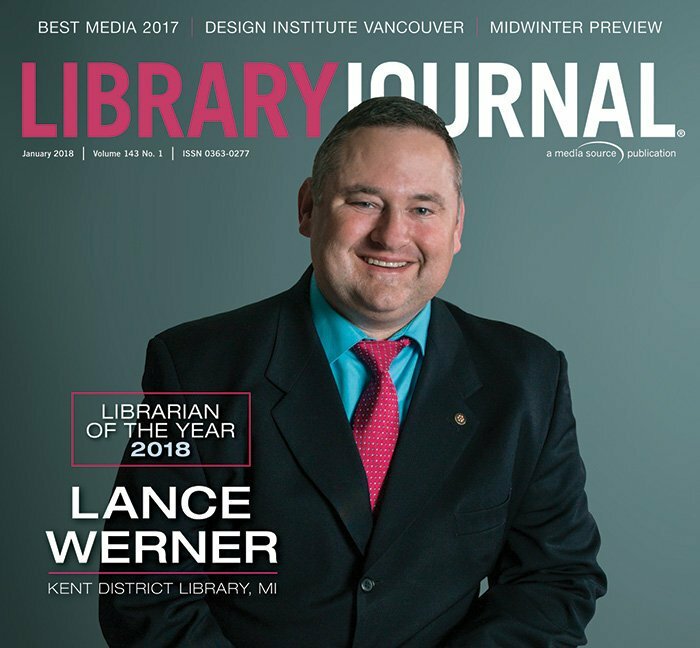 As a licensed advocate and Director of a new library project intended to bring thousands of new readers from disadvantaged countries through creative teaching, I applaud Lance Werner on so many levels. I would also point out that when our program reached out to Houston ISD to promote an essay contest to assist financially for damaged schools we ran into RED tape. Turns out you can't give HISD money until they take a month which by then affected a time sensitive deadline. So Mr. W please give us contacts in Port Arthur because we want to help those in need who are grateful for an opportunity without strings attached. Congratulations Lance. Well deserved recognition. My sincere thanks to you all! I feel like I work in the best profession on earth with the most wonderful people that I know. There has never been a better time to work in libraries. We have a unique opportunity and duty to ensure libraries and librarianship remain viable and vibrant for generations to come. I encourage everyone to run as hard as you can and act with kindness, empathy, and love. 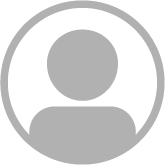 Thank you for your interest and I am happy to share our contact information. Please email me at lwerner@kdl.org. Thank you! I truly enjoyed speaking and meeting everyone at the Canadian PLLeaders Program! I would like to thank EveryLibrary for the opportunity. Thank you so much Kyle! It's great to hear from a "good ol' days" friend :^) I hope you're doing well!! Congrats Lance! Proud to know you and look forward to learning more from your approach to business! Thank you Dave! I look forward to our next meeting.